Our Scändic Hand & Body Moisturizers are formulated using Jojoba Oil as our base oil. We have also sourced several “super fruits” from Scandinavia that result in a synergistic blend that creates a very premium moisturizer. Arctic Cloudberry Seed Oil (Finland) and Arctic Lingonberry Extract (Sweden) are highly antioxidant ingredients that are excellent for skin cell regeneration and a reduction in wrinkles. They were all given product names of Nordic origins. They contain pure therapeutic grade essential oils (some are organic). We use “sulfate/ paraben free preservatives” phenoxyethanol and caprylyl glycol in all of our scändic hand and body moisturizers. 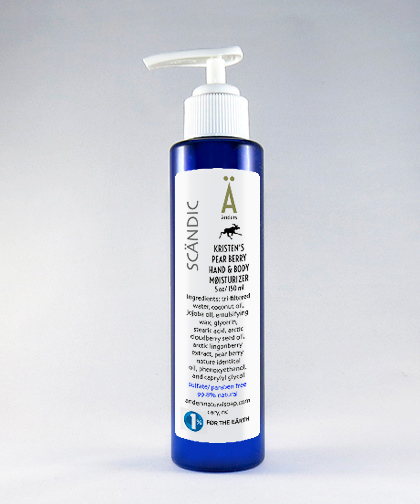 Our moisturizers are packaged in cobalt blue PET bottles and a white pump with a rectangular label attached. Organic jojoba oil is a botanical extract of the seed of an evergreen shrub. Technically it is not exactly an oil, but a wax ester. This wax ester is very similar to human sebum (our natural skin oil). It is extremely close to our skins natural pH and aids in the balancing of our skins oil production. The ingredient Jojoba provides all day moisturizing, and it is used in all of our hand and body moisturizers, deodorants, facial products and beard oil. Used in the base mix of oils, coconut oil is derived from the coconut fruit. This vitamin rich oil is used in body care products for its naturally emollient (softening) and lubricating properties. This gentle oil is naturally antiseptic and antioxidant, making it a great ingredient for the skin. Hydrating and soothing make this oil a perfect addition in skin care. Cloudberries are wild berries that grow all over Finland, but are most abundant in boggy areas around the Arctic Circle. Because of its ability to survive temperatures of -40° F, the Cloudberry is one of the few flowering plants to have spread to the farthest north. Its geographical location, with nights that are significantly colder than the days, enables Cloudberries to produce twice as much vitamin C as oranges. Cloudberry Seed oil contains large amounts of linoleic and alpha-linoleic acid (omega 6 & omega 3), vitamins A and E, and plant sterols. It strengthens skin, prevents aging and due to its antioxidant effects, protects skin from external factors. Moreover, the detoxification properties of Cloudberry Seed oil help to make the skin look brighter and more radiant. The benefits of Cloudberry seed oil have been studied in numerous independent cosmetic labs. It has been proven from investigations in independent labs in Finland to be one of the most effective antioxidants for preventing oxidation of the skins structure. The Lingonberry is Scandinavia&apos;s most widely harvested wild berry. It grows in dry soil, especially in spruce forests and lichen-covered ground. Lingonberry is very popular as an ingredient for its beneficial effects on skin. The berry extract contains large amounts of flavonoids, moisturizing properties, phenol compounds and antioxidants. The seed oil promotes skin renewal. Antioxidants and essential fatty acids (omegas) provide the skin with important nutrition. The leaves of the Lingonberry plant contain arbutin, which has a lightening effect on skin discoloration. Lingonberry has high levels of vitamin C, which protects and brightens the skin. Pear Berry nature identical oil is a natural oil mixed into the soap to give a very pleasant scent of pears and berries. A very fruity blend. We recommend that you apply your Hand & Body Moisturizer every day. Because of the formulation that creates a thick consistency, only a small amount will be necessary. Smooth into skin, massage gently and enjoy your soft great smelling skin. Many people use our moisturizer on the face as well as the rest of the body. The Jojoba oil base that we pride our formulation on creates a very grease-free feel to the skin. Most everyone who samples our Hand & Body Moisturizers at the Raleigh Farmers Market buy one or more bottles. copyright © 2007-2019 änders natural soap co., inc.